*Disclaimer: My meal from Feast Happy was complimentary in exchange for a review. The last few weeks have been absolutely mental and the clocks going back make me feel like I have even less time in the evenings than I did before! As someone who likes to be in bed by 10pm I’ve found myself awake at midnight still trying tick things off my to-do list and it’s just exhausting. The first thing to go out the window when life is like this is looking after myself. I have a million things to do I really can’t afford to spend an hour in the gym. Why would I spend half an hour cooking dinner when I can throw something in the microwave and let it do its thing? Given that I’m trying to lose weight for Christmas this doesn’t really help my cause. Enter Feast Happy, a great new gourmet food-tech delivery service that’s just launched right here in London. So how do Feast Happy meals differ from all the other delivery services that London has to offer? Prepared fresh each day with healthy, locally sourced ingredients. Arrive par-cooked so that they remain fresh and won’t dry out or go soggy before you can get around to eating them. 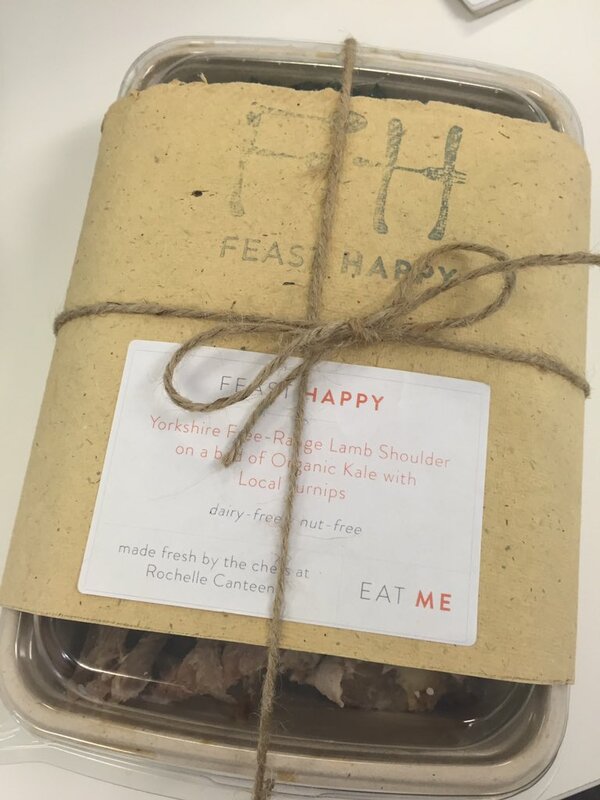 Tom, one of the founders of Feast Happy, kindly hand-delivered one of their meals to me at my office in Central London (you can see their delivery map here) a couple of weeks ago so I could taste test it for myself. The option for that day was a beautiful British free range lamb shoulder on a bed of organic kale. Paired with fresh, local turnips and shallots. It came wrapped up in 100% recyclable packaging with a rustic wraparound that included cooking instructions and all finished off with a beautiful twine bow! I know aesthetics aren’t everything but I was very impressed. The cooking instructions were really easy to follow and I had a piping hot meal in front of me in just 15 minutes. Now confession time: before this I had never eaten lamb or kale (!) so I wasn’t really sure what to expect. Lamb is quite a fatty meat and while I wasn’t keen on those parts the leaner cuts of meat were melt in your mouth delicious, the vegetables were cooked to perfection and I really loved the kale too! Overall winner in my book. At the moment they’re offering an exotic lamb harira with bulgur wheat, carrots, chickpeas & coriander which looks delicious too. For someone as busy as I am these meals are an amazing idea for those nights when you just know you won’t have time to cook anything half decent. You need to place your order by 6pm the day before but once you’ve done that you just sit back and wait for it to be delivered at the agreed time. Once it’s on its way you can even watch your bicycle courier approach so you know exactly when they’ll arrive which is a great touch. Find out more on their website.